Many aren’t aware of the intriguing artifacts that rest on campus, and often times are only found when searching through MOA for over an hour. The Museum of Anthropology (MOA) is home to over 45,000 various items from around the world. However, many aren’t aware of the intriguing artifacts that rest on campus and often times are only found when searching through MOA for over an hour. These wooden planks served as shields of protection to the people of New Guinea. In the 1980s, interest in learning to fight with Highland shields came back after years of being considered obsolete. The one in MOA was repainted with a newer, more vibrantly-coloured image with references to the New Guinean culture. The character painted on this shield is The Phantom, a comic book superhero who fights crime in a fictional African country Bangalla. 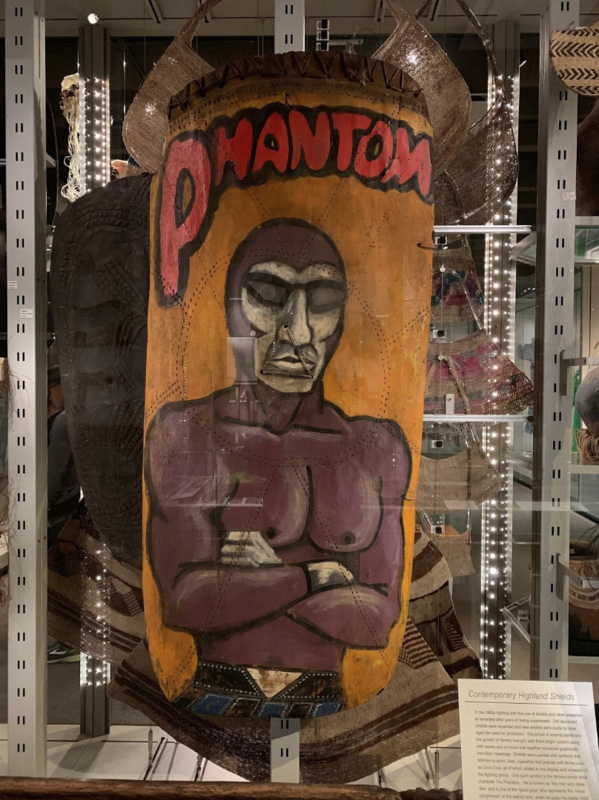 Surprisingly, The Phantom has a real-life history of helping to create an identity for some tribes and appearing on many shields from the New Guinea Highlands. Malagan refers to a series of ceremonies native to New Ireland in Papua New Guinea and the art that usually is presented with them. In MOA’s collection of Malagan carvings, there are dozens of artworks ranging from masks, propeller-like figures, instruments and sculptures. Many of the items in this section are parts of larger pieces and their interconnection shows that Malagan does not refer to just one aspect of the ceremonies. It shows that everything is a part of a larger body of art. The sculpture from the Solomon Islands is a woman’s bust created with real hair and decorated with shells and ebony. 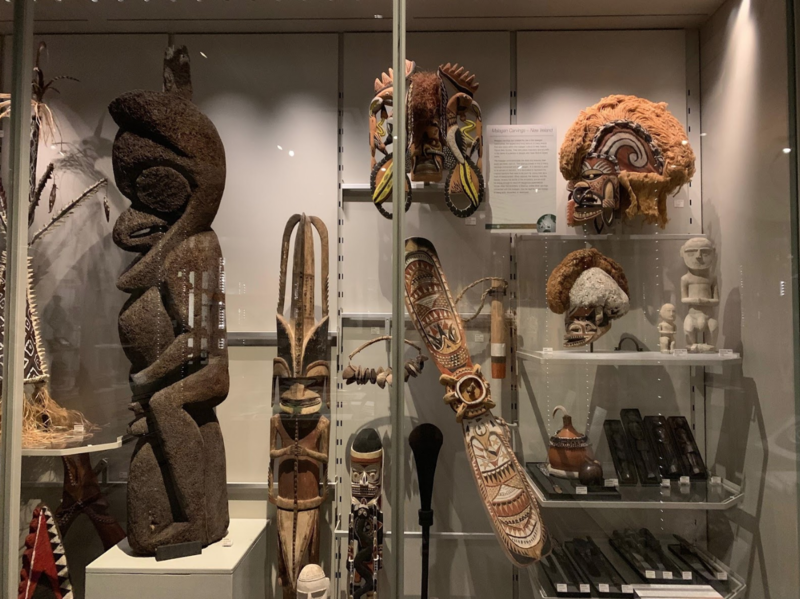 These unique form of wood carvings is a tradition in the Solomon Islands and is deeply rooted in their culture. The Solomon Islands are known for their intricate designs and adornments of their sculptures. The black pigment is in sharp contrast to the vibrant colour of her hair and the silver markings on her face. She is accessorized with large earrings and painted with complex designs. 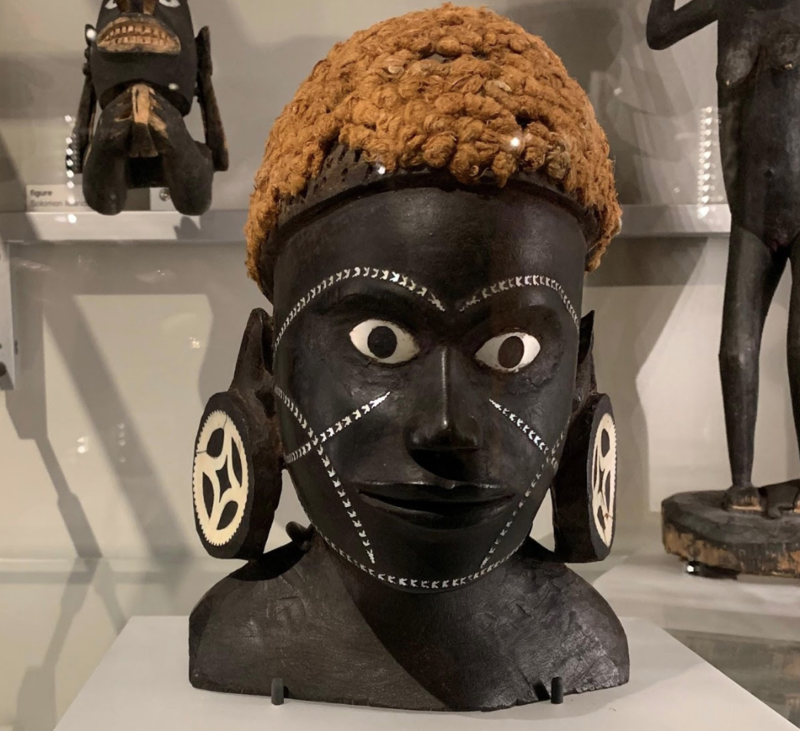 It’s not completely clear why this bust was sculpted, but it could be a way of celebrating various focal points in people’s lives such as the passage to adulthood, marriage or death.